exchange for carbon dioxide. 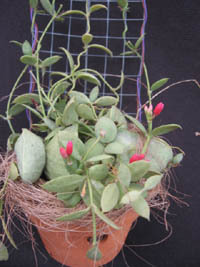 It is an epiphyte vine related to Hoyas. the plant. They are an air plant and should not be grown in soil. 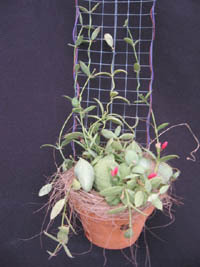 Normally small, hanging baskets with an 'Orchid Bark Mix' is used. Smaller pots are preferred. too much water and misting the plant once or twice a week should do the job. Liquid feeding once a month with half strength is adequate. 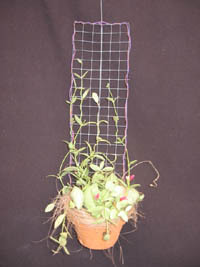 The plant will grow better if kept above 55° all the time and should flower most of the year. The flowers are red and small.